If you're feeling in the mood for romance, let the decadence of Cupid's Kiss sweep you off your feet. With a full Swiss chocolate profusion of flavor, this Cupid's Kiss also features undertones of French caramel and roasted Southern pecans. Made with 100% authentic Arabica beans, this 2 calorie per cup flavored coffee is the ultimate indulgence with its hearty roasted flavor. Perfect for those that want to have a love affair with their chocolate-inspired coffee, the Cupid's Kiss flavored coffee will hit the spot with its unique collaboration of flavors. 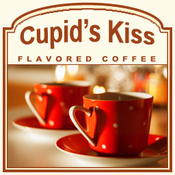 Roasted and shipped on the same day, the Cupid's Kiss flavored coffee will be packaged in a heat-sealed valve bag to preserve its delicious, wholesome flavor and gourmet taste. Go ahead and let yourself flirt with Cupid � this is a coffee romance you will not want to miss out on!